A 300,000 square foot expansion of one of Dubai’s older malls, Ibn Battuta, has just opened. This has brought 60 new cafes, shops and services to the centre, and it means there are now almost 400 shops in the mall. And, that’s not all, there are more extensions planned for the exploration-themed mall. Once all of the development is complete, Ibn Battuta will span 7 million square feet (Dubai Mall is 12 million square feet). Among the new shops opened today you’ll find a Marks & Spencer, a Decathlon, United Furniture, Under Armour, Paul, Superdry, Jashanmal, Iconic and more. 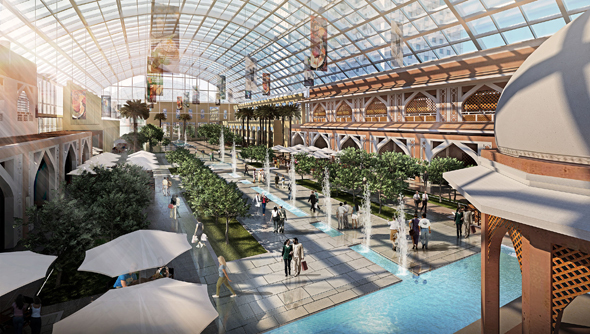 The mall will soon also get a two-storey link that connects Ibn Battuta Metro Station to the shops (that’s due to open in a matter of weeks) as well as a 372-room Premier Inn. Later this year, another 90 outlets, including a 24-hour foodcourt, will be opened. But the development will continue into 2017… By the third quarter of next year we’ll see a multi-storey parking facility built, as well as a new cinema complex. Then, the go-big-or-go-home plans come out with the construction of a 300,000 sq ft courtyard. The space will be filled with natural light in the summer months, but in the winter months will actually be open air, as it has a retractable glass roof. We’re getting plus-size Mercato vibes from the courtyard coming to Ibn Battuta in a few years (except this one has a retractable roof). The courtyard will be the size of four football fields, and will be home to around 80 new shops and restaurants.